I needed some quick product to fill the shelves at the gallery so that was the inspiration behind these. I made a bunch of them since they are easy to build and with a router template, simple feet can be added to class them up a bit. 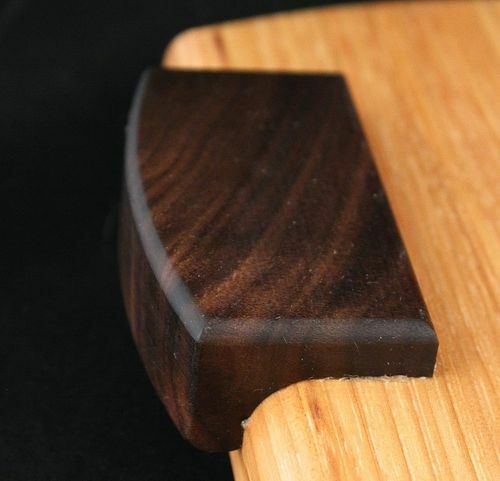 Basically a very simple, small, long grain cutting board sized for a loaf of bread. 1” thick, 12” long, 6” wide. The two shown in the photo are hickory and fumed white oak. The feet are walnut and the finish is a day long soak in a bath of mineral oil. The feet have a radius on their exposed sides and are cut to wrap around the round-over of the boards body. A 3/4” round over bit and 3/4” core box bit made this easy! I like these a lot. For me these wouldn’t be a quick project. Getting those feet to come out that nice would be a disaster!! You could use round feet and use a drill bit to indent them, would be much faster. One great project ether way it’s done, it has that Green and Green feel to it. Thanks for the comments Scott, htl. I had a long narrow walnut blank, double the door width, and used the table saw to cut a rabbet along both edges to remove the bulk of the waste. I then ran the long edge (on a router table) against a box core bit with both the edge and top against the router table to get the correct profile. The blank was then halved and chopped into the required foot lengths, then the curve was routed with a template. The drill bit method would work as well except you would cut the feet to size first, drill the (3/4”) hole with a forester or brad point bit, route the curve, then cut the section out on the TS. Indeed it seems like a bit faster method if you only need a few feet. Splint, nice work and your sales must have been strong. Congratulations! 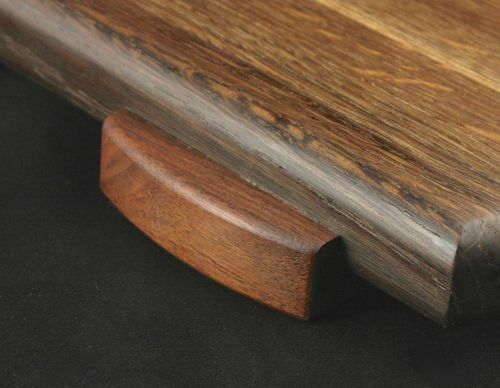 Great looking loaf boards—should be popular as gifts! That is a great looking set of boards. Gonna have to add that to the list of projects when I get home from deployment. You mention an overnight soak in mineral oil. How well does that work out for you? Doe you have to repeat? Is seems that there may be flooding of mineral oil that would “leak” for a few days after. What has your experience been with this process? Great idea, I have lots of short thin (1” thick) pieces that would glue up real nice for a project like this. I like the idea of the shown feet as well. I use to just wipe some on then wipe it off after it sat awhile. This worked ok, but with the number I made here that process (usually over 2-3 days) would have jammed up the work area. The soaking is nice in that I can just plop them into the tub for a day then let them hang over it for another day. Very little excess to wipe up. I give them another quick wipe for any seepage before dropping them off. Soaking really suits mass production, seems to give better penetration/coverage, and gets the job done with less fuss. I always leave instructions with each board about needing to periodically refresh the oil. I really like these. A little bit of extra work really serves to create a differential in the finished product. I appreciate the factory approach to making the feet. In a way, finding a simple repetitive way to create a piece that looks hand worked is as much a skill as being able to do the hand work. Thanks for the reply. I have been thinking about trying this as I never make less than 3 boards at a time but have read mixed reviews. Gonna have to give it a try next time.